A talk and book signing with Dr. Nadine Burke Harris, author of The Deepest Well: Healing the Long-Terms Effects of Childhood Adversity, launched Trauma-Free NYC, a Columbia University-wide effort to create a “trauma-informed city.” Dr. Burke Harris described how Adverse Childhood Experiences (ACEs) and toxic stress can lead to lifelong health problems, and what can be done to break the cycle. The book was released to the Columbia community at a campus-wide event on January 22nd at the Italian Academy on the Morningside campus in advance of its publication. A world-renowned pediatrician, Dr. Burke Harris is the founder and CEO of the Center for Youth Wellness in San Francisco, an organization working to transform pediatric medicine and the way society responds to children who have experienced trauma and challenging situations early in their life. ACEs, as defined by the Centers for Disease Control, can include witnessing domestic violence, being a victim of child abuse or neglect, and even parental separation or divorce. The event was sponsored by Mailman’s Child Health Initiative for Learning and Development (CHILD), the Columbia University Center for Science and Society, and Trauma-Free NYC, a university-community partnership. Trauma-Free NYC aims to increase public awareness of ACEs; serve as a resource for the creation of a cross-sector coalition; promote research and demonstration activities; and design educational, training, and service learning programs in trauma-informed practices for the wider NYC community. Dr. Burke Harris shared insights from The Deepest Well and discussed the impact of ACEs on our brains and bodies, highlighting promising interventions to prevent and mitigate trauma’s effects. 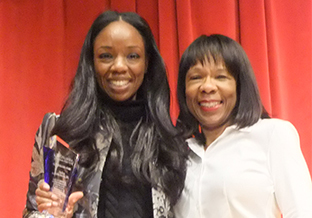 She was presented with the first Trauma-Free NYC Trailblazer Award for her leadership in this movement. “Chronic stress crosses socioeconomic lines, can be long-lasting and is transmitted from generation to generation. Children, with their developing brains, are particularly affected by toxic stress,” noted Dr. Burke Harris, whose research found that 51 percent of children with three or more adverse effects had learning issues. Other known effects include increased risk of heart disease, diabetes, depression, substance abuse, involvement with the juvenile and criminal justice system, and suicidality.